John Dillard Bellamy, M.D. (1817-1896) married Eliza McIlhenny Harriss (1821–1907) on June 12, 1839. Over the next twenty-two years Dr. and Mrs. Bellamy would welcome ten children to their family (see chart). As a young man, Bellamy inherited a large piece of his father’s plantation in South Carolina, along with several slaves. He soon moved to Wilmington, North Carolina, to begin studying medicine with Dr. William James Harriss. 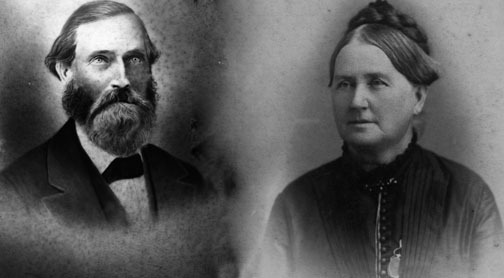 Bellamy would later marry Dr. Harriss' eldest daughter, Eliza. After leaving for two years in 1837 to study at Jefferson Medical College in Philadelphia, Pennsylvania, Bellamy returned to Wilmington in 1839, married Eliza, and took over Dr. Harriss’ medical practice after Eliza’s father’s untimely death in July. By 1860, as the Bellamy family prepared to move into their new home on Market Street. Their family now included eight children aged one to nineteen. Along with the ten members of the Bellamy family, living at the household were also nine slaves including Tony, Guy, Joan, Sarah, Mary Ann, and Caroline. In 1861, Robert Rankin would be the last of the children, and the only one to be born in the mansion on Market Street. The Bellamy Family at Wrightsville Beach, NC. The sons of Dr. John D. Bellamy would follow in their father’s footsteps and become successful students and career men in and outside of Wilmington. Marsden, the eldest of the sons, became a prominent trial attorney in Wilmington. William had a successful medical practice of his own, just as his father and grandfather had in Wilmington. George became a farmer and took over Grovely Plantation, land that his father purchased in 1842, in Brunswick County, North Carolina. The youngest son, Robert, became a successful businessman in the pharmaceutical industry. John Jr. attended Davidson College and the University of Virginia Law School and eventually became a successful politician in the conservative Democratic Party. From 1899-1903, John Jr. represented North Carolina as a United States Congressman. Chesley Calhoun unfortunately died at the young age of twenty-one, while studying at Davidson College. Elizabeth "Belle" Bellamy was the only daughter to marry and have children. Elizabeth (Belle) married William Jefferson Duffie of Columbia, South Carolina on September 12, 1876. They had two children, Eliza (Elise) Bellamy Duffie, and Ellen Douglas Duffie. John D. Bellamy's other daughters, Eliza and Ellen, would live out their days unmarried in the family mansion on Market Street. One child, Kate Taylor, died as an infant in 1858. All together, the children of Dr. and Mrs. Bellamy would have thirty children of their own.